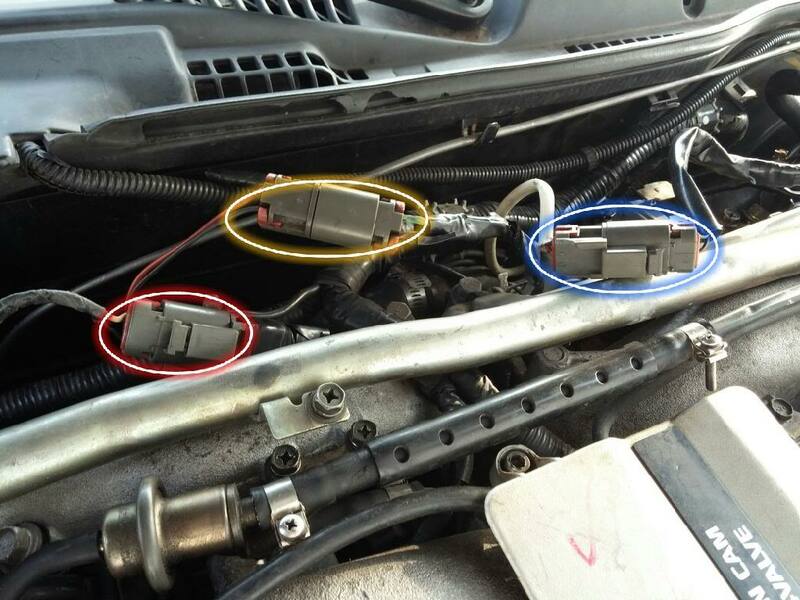 -The red circle is where I have the det sensor bypass (resistor) connected to a white & black harness, though it's coming from the passenger side of the engine. It looks like when the PO did a motor swap he messed up where the harness is run because there'd a lot of wiring just dangling. -The yellow circle is where I plugged in the passenger side vtc into a fairly heavy gauge green/black & red/black wires at the harness. -The blue circle is where I have the driver side vtc plugged in to a smaller gauge green/black & red/black wires at the harness. Please help figure out what I'm doing wrong! Your FSM has no photos/diagrams to help? If you don't have it, check out http://www.xenonz32.com/reference.html Lotsa other docs, too. Maybe you can persuade/beg/bribe someone here with a Z32 that runs perfect to take the same photo of their connectors and post them for you here. That would be a cool thing to do... I'd offer $10 and see if there are any takers. Last edited by zxguy1986; 04-01-2014 at 03:45 PM.